The United Kingdom has costly private dental care. High variations in prices from region to region and overcharges are enough reasons to determine people to look for dental treatments abroad. For those that are considering traveling from the United Kingdom to other countries in Europe for dental treatments, Romania is an excellent choice as the country offers low costs altogether complete with highly professional dental services. Our dentists in Bucharest are ready to give you a regular check-up and then talk you through the available treatment options. While in Romania, you can choose to perform a series of dental procedures at almost half the cost, and still have time to visit some of the most beautiful places in Bucharest. Romania is easily accessible by plane from the UK and there are a number of airline operators that offer extremely affordable airplane tickets to and from the United Kingdom, especially when flying from London. If you can take the time to plan you dental trip to Romania in advance, getting here will be both fast and cheap. Once you are in Bucharest you can choose to stay at a four star hotel in the centre of the city that offers numerous facilities for approximately 55 £ per night per person. Fees are even lower for three star hotels that also have various offers for tourists in Romania. Transportation is affordable in Bucharest and, unlike in London, the public transport system does not have different fees for different parts of the city. One bus ticket will be approximately 0.26 £ and two metro tickets will be approximately 0.8 £. Taxi fees are approximately 0.30 £ per kilometre. 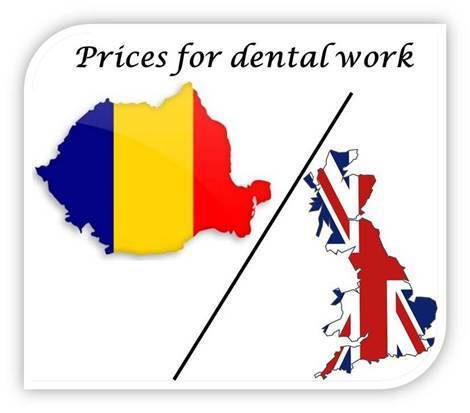 Dental treatments in Romania are highly affordable but that doesn’t mean that a lower price is an indicator of poorer quality. On the contrary, our dentists in Bucharest are highly trained professionals that work with the best materials. An easy comparison can be made for dental crowns that cost only up to 350 euros (approximately 260£) while in the UK their price can be 600£. Dental implants are another popular treatment choice in Romania. Because this dental procedure is more complex, in the UK it can start at 1600£ while in Romania dental implants start at 450 euros (approximately 330£). Root canal treatments are another service that is more expensive in the UK (starting with 300£) and more affordable in Romania (starting as low as 70 euros, approximately 52£). Our dentists in Bucharest can help you compare any dental treatment and together with them you can schedule a complete dental plan according to your needs. Please contact us if you are interested in dental travel in Romania.